To reduce my household budget, I had to stare down my fears and ask the 99-cent store guy for a discount. The other night, despite recent household budget cutbacks, my husband, kids and I threw a spontaneous (modest) dinner party, inviting two families we've recently become friendly with. 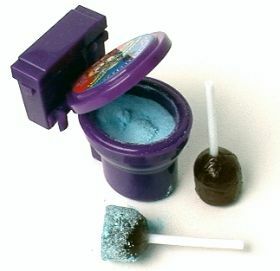 Upon arrival, one of the men, who'd come straight from his Wall Street office, presented the five assembled children with small gifts: Sour Flush candies, packaged in little plastic toilets with lollipop "plungers." As the small people gleefully jumped up and down, spreading the sugary contents of their wee loos every which way, the rest of the parents looked quizzically at the bestower of the peculiar presents. "I haggled," he explained, with a shrug. "I wanted to see how low the guy would go." Yes, there are people who haggle just for fun. Me, not so much. The mere thought of asking for someone to knock a buck or two off the price of a damaged item causes my stomach to push against my throat, my vision to narrow, my breathing to grow shallow. But the global economic crunch, plus my own current circumstances -- no full-time job, staggering COBRA payments, a house I'd prefer not to foreclose upon, children who require irritatingly regular feedings -- dictate that I save wherever possible. And so, a few months back, I got on the horn to the cable company and sheepishly asked if there was a way to lower my monthly payments without sacrificing the children's TV programming on which my early-morning sleep depends: To my surprise, the customer-service representative instantly slashed my monthly bill in half by cutting some feature I didn't even know I had. Emboldened, I dialed up the New York Times, my long-distance phone carrier and anyone else I could think of, whittling down my standing monthly charges until they were as slim as a post-NutriSystem Marie Osmond, or -- more aptly -- as slim as my wallet these days. I knew there was more budget-trimming work to be done. But negotiating with a faceless stranger is one thing. Haggling in person? Hello, panic attack. I mean, did I really want to be that person? No, I … simply … couldn't … do it. According to Delee Fromm, an Ontario-based lawyer and psychologist who lectures and conducts workshops on negotiation, my response is not at all unusual, especially considering my gender. "Women tend to feel more anxiety negotiating than men do," she tells me, citing a statistic from Linda Babcock and Sara Laschever's "Women Don't Ask: Negotiation and the Gender Divide": Two and a half times more women than men say they feel "a great deal of apprehension" about negotiation. Babcock and Laschever have also found that women initiate negotiations about a fourth as often as men do, and will frequently pay a great deal of money to avoid it; that 20 percent of women refuse to negotiate at all, even when they know it is in their favor; and that men tend to see haggling as a game, whereas women see it more like "going to the dentist." Ugh. "Boys, because they're socialized early playing sports, get the game of it: Look what I got! I scored!" Fromm explains, whereas the majority of women are socialized to be less comfortable with competition. "We're more relational. We value harmony." We're also more pessimistic about the results -- and afraid that the other person won't like us. Both Fromm and Tom Hayman, owner and CEO of Negotiation Expertise LLC, a national training and coaching company, advise me to get comfortable with negotiation by practicing. "Negotiation is an acquired skill," says Hayman. "All professionals practice. Confidence comes from the training, the skills and the knowledge." Hayman suggests I go to a car dealership to work on my technique. Fromm recommends asking for a discount on everything I buy, including my morning coffee. (I now save by brewing at home, but whatever.) "Remember, it's a game," she says. But both scenarios petrify me. "Just say, 'Is that the best you can do?' And then be quiet," says Hayman. "Silence is a great tactic. Many people are uncomfortable with silence. And you can always walk away. In this economy, the market power is on your side." That assessment is shared by Rick Doble, proprietor of the Web site Savvy-Discounts.com, co-author of the new book "Cheaper: Insiders' Tips for Saving on Everything" and the self-proclaimed "king of haggling." "If you're ready to buy, businesses really don't want you to walk out the door right now," Doble says, noting that merchants' increasing willingness to come down on price has had a marked effect. While just two years ago, 33 percent of Americans haggled, he says, citing a study by America's Research Group, today 67 percent do. According to Doble, you can haggle pretty much anywhere -- from Macy's to Kmart to your local supermarket -- but, he suggests, your best bets are hotel rooms, bulk purchases, big-ticket items, anything marked down or damaged, floor models, used items or open packages. In those situations, says Doble, "It's almost crazy not to bargain." After all, merely asking for a better price -- on, say, an appliance -- can save you hundreds of dollars. But, Doble warns, "Don't ever be disrespectful and knock down the item. And don't try to haggle with someone who doesn't have the authority or the time to talk; it's just a waste of your time." Negotiation experts tend to toss around terms like "win-win," "competitive" vs. "collaborative negotiation," "BATNA." But Fromm gives me one tip that really resonates: "Negotiate for yourself as if you are negotiating for others," she says, noting that women tend to negotiate most successfully -- better even than men -- when they are doing so on others' behalf. "Think about all the people that depend on you: your family, your children, whoever, who are going to benefit." If I must haggle, let it be for the sake of the children! So before I can think too hard about it, I drive to my kids' favorite place of business, the 99-cent store -- where everything is now upward of $1.29 -- to shop for an upcoming holiday. My extended family is coming to town for a big celebration, so I stock up on several items in bulk. Taking deep, relaxing breaths and focusing on the joy the plastic doodads I'm clutching will bring to my offspring and their cousins, I wait for the long line at the register to taper off. Then I unload the contents of my basket onto the raised counter, look up at the woman on the platform behind it and say, with a surprisingly steady voice, "I'm buying a lot. Would it be possible to get a discount?" She looks at me, clearly taken aback and a little irritated. "I'd have to get the owner," she says, as if that will end the conversation. She rings up three more customers while I wait, probably hoping I'll give it up and go away, then reluctantly rouses herself and comes back with the owner, a kindly man to whom I repeat my question and fall silent. He smiles at me. "Well," he says, "you are buying a lot." He turns to the woman at the register. "Charge her 99 cents for these," he says, pointing to eight items in my basket priced at $1.29. And these," he says, waving at eight more priced at $1.49. Then he looks at me apologetically, eyeing two large items selling for $1.99. "I can't go any lower on those. Just the delivery charges have gotten so expensive." Then he says, "OK, charge her $1.49." The woman at the register sourly does as she is told. I thank them both and pay in cash. The owner thanks me, looks me solidly in the eye and warmly wishes me a good holiday. He really sounds like he means it. Walking out, I feel strangely elated. It's not just that I've saved a whopping $7.40, a full 20 percent of my total purchase. And it's not just pride at having accomplished something I have long feared either. More than anything, I have the happy feeling of having made a connection. Instead of another soulless transaction in which neither buyer nor seller can be bothered to look the other person in the eye, I had a real exchange that allowed both parties to acknowledge that, though times are tough and money is tight, we can still help each other out: I by buying what the 99-cent store owner was selling; he by giving me a good price. I had expected to feel like a charity case, or worse, like a wheeler-dealer, but I came away feeling somehow more human. And you know what? I might just try it again.